By the end of 2011 Facebook introduced timeline to tell the story of your life. Of course not really the entire of your life, just a life that starting from the day you become the member of Facebook. There are people like or dislike this new feature. Some say that they don’t want people to see his whole life story in Facebook , although there is a feature to hide part of your post. 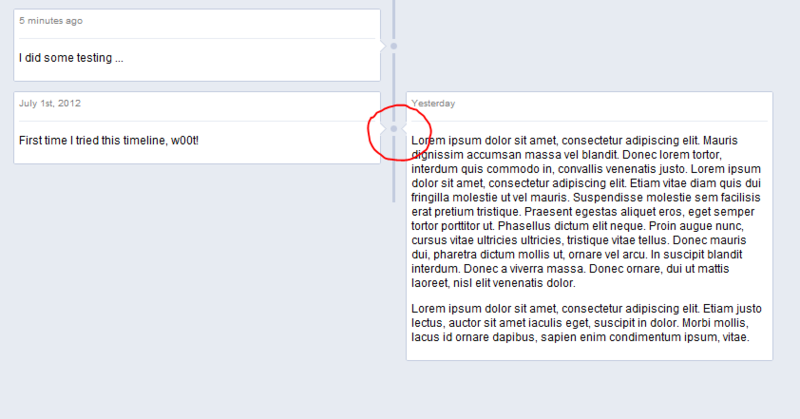 In this post I am going to show you how to create your own Facebook timeline using HTML and CSS only. You can use the timeline to show your activity during a year or to tell the story of your life on your personal web page. The first step, I create the HTML code that consist of list. I use OL and then detect which one is even or odd. Then I use CSS to float one of them to the right. I also use a small blue images as the background of OL to create the vertical line. Here is the HTML code. You can add more list if you want, the above code only have four list to make it easier to follow. Then I create CSS for the OL and put an image as a background to create a vertical line. I put the background on the center and repeat the images on y-axis. Each post on your timeline is displayed to the right and left of the center line. If it odd list, then I float it to the right and put it on the left if it is even. I use nth-of-type to check the list whether it is odd or even. You can read my previous post on checking the odd or even on the list. Actually I don’t know what it is called, something that face to left and facing the vertical line if your post on the right. Let us call it the arrow. If your post on the left, then the arrow should face to the right to show to the timeline that it is your post. I use two images of arrow and use the same method to check the even or odd. If it is odd, then the post will float to the right so I should use the right arrow. By the end of this post, you should get the result like the image below. Of course I add more code to create the header. You can get the header on the download version. Very nice job! Try to do this. hello i have tried to use your tutorial but i am new to css and html, i wish to make a timeline of fashion for one of my pages on my tumblr blog do i have to do anything differently? Oh, I also switched the even/odd in the CSS so start the box at the left instead of the right side. I was able to get the arrows offset by changing the background properties on the evens. I made the background bigger, set the picture to show up at the bottom, and made it non-repeating. Congratulations, very very very very very good! Excellent work. Would it be possible to make it a bit more easier for non techies who does not know html ? I wanted to let you know that I successfully got the arrows to not point at the same spot by changing the background of the even entries. I changed 15px to 45px, then had the image show up at the bottom and not repeated. If you want it to show up lower, you can make 45px a larger number. Be careful not to make the pixel amount larger than the items height, however.